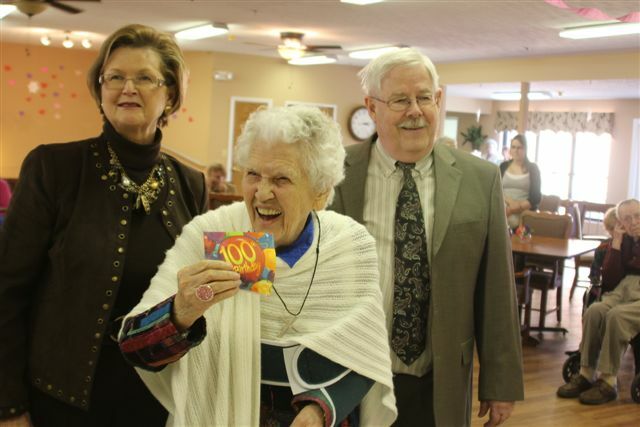 Hazel Jackson (center) shows off a birthday card from APCo President and COO Charles Patton during her 100th birthday celebration. February 6 was a very special day for Appalachian Power retiree Hazel Jackson. Surrounded by family and friends, Jackson celebrated her 100th birthday in the main dining hall at Wheatland Assisted Living in Hillsville, Va.
Born in Galax, Va., Hazel was an entrepreneur before coming to APCo after owning a store in Galax called the Variety. She began working for Appalachian Power on January 2, 1946, as a teller at the company’s Galax office. She also worked in Pulaski, Christiansburg and Hillsville. Jackson retired from the company on January 31, 1972.